In the home, office or classroom, a wireless connection can be beneficial. 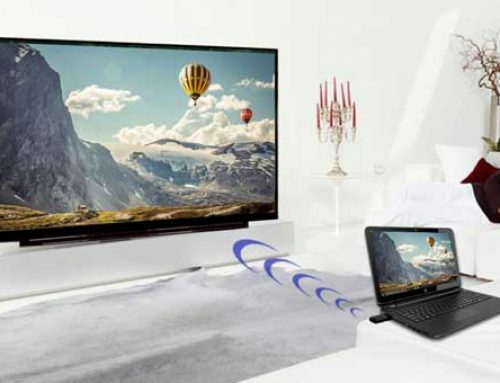 Because laptops and other media devices come equipped with HDMI ports, it’s easy to connect them to TVs and projectors. Problem is they create an unattractive and cumbersome area. Wires and cables lying on the floor can get messy. Most importantly, they create more inconvenience to daily living. 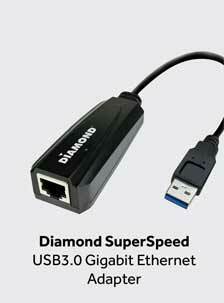 Therefore, Diamond Multimedia has created some of the best products for wireless HDMI technology available today. 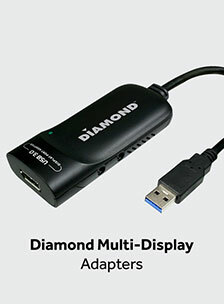 Diamond Multimedia offers a few different models of wireless HDMI Sender and Receivers. So, in this article, we will take a closer look at their features and differences. 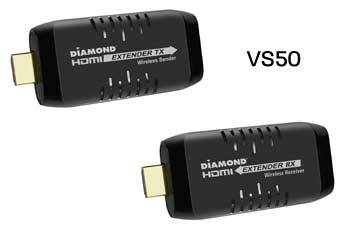 The Diamond V-Stream VS50 Wireless HDMI Sender and Receiver is great for simple, single-device connections. It can also stream about 30 feet from its original video source. Therefore, if you’re looking to stream audio and video from a laptop to a nearby monitor, the VS50 may be the best wireless HDMI device you can buy. 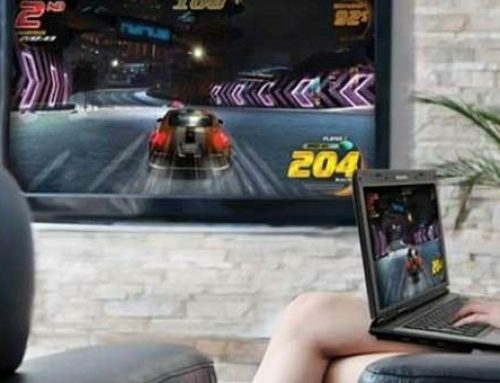 The VS50 would also be great in a work situation such as giving a presentation in which your laptop is close to the big screen or projector. Use the Diamond V-Stream – VS50 in the office or the classroom. 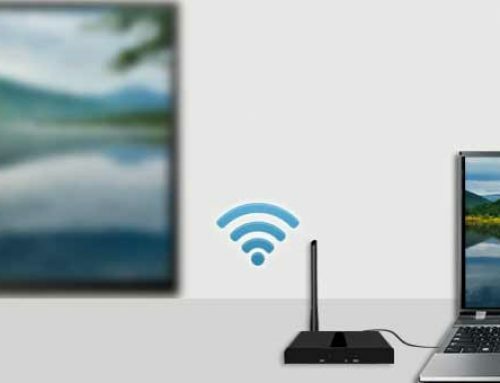 Connect a laptop to a big TV monitor or projector – wirelessly. It’s also perfect for displaying your content to co-workers and students. 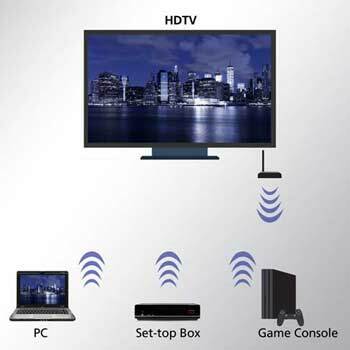 Also, the freedom of wireless HDMI streaming, business and educational applications creates much more efficiency. • Support HDMI1.3, compatible with HDCP1.2. • Maximum resolution up to 1080p full HD. • Supports point to point wireless configuration. • Plug and play, easy installation. 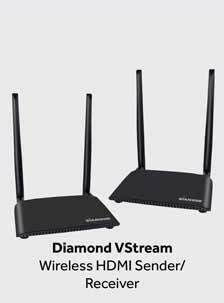 The Diamond V-Stream VS100 Wireless HDMI Sender and Receiver takes things a bit further and can send a wireless signal through walls, making it perfect for transmitting HDMI signals between rooms in your home. Compared to the VS50, the VS100 can stream about 150 feet direct line-of-sight from its original video source. 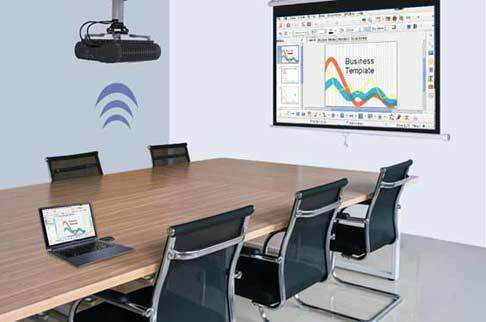 It’s also a great solution for conference room meetings, home entertainment and multimedia and educational applications. And the VS100 also lets you enjoy your TV in other parts of the house. No connecting any extra cables or buying an extra cable box. Therefore, the family room, bedroom, kitchen or office, can now be your main TV viewing area. 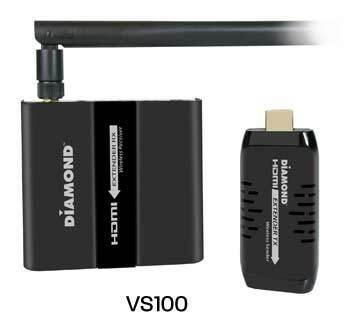 The Diamond VS100 is a powerful Wireless HDMI Sender and Receiver. 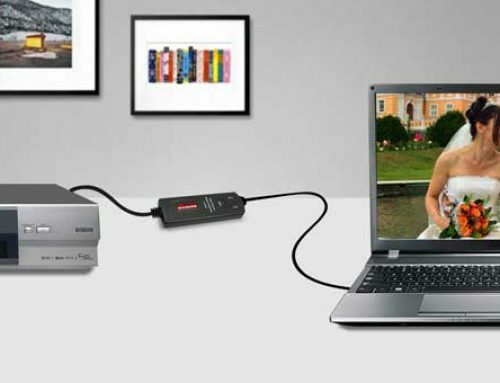 Wirelessly transmit video and audio from any HDMI source in high-definition. Enjoy a true, crystal-clear signal in any location throughout your home or office. 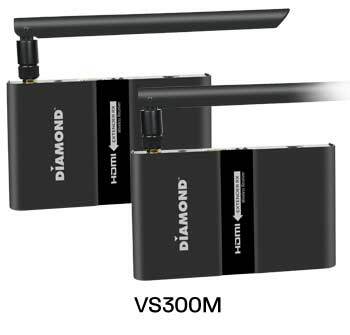 Diamond also offers the V-Stream VS300M Wireless HDMI Sender and Receiver. It’s an HDMI to HDMI, Multi-Room, Multi-Wireless Channel Extender Kit. 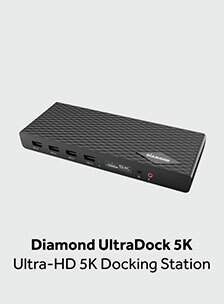 VS300M allows for seamless full HD 1080P@60/50Hz streaming from your cable box, Blu-ray player, gaming console, satellite box, PC, Mac, laptop any other HDMI enabled source without the need cables that clutter your entertainment center to your HD TV or projector up to 150 ft clear line of site. 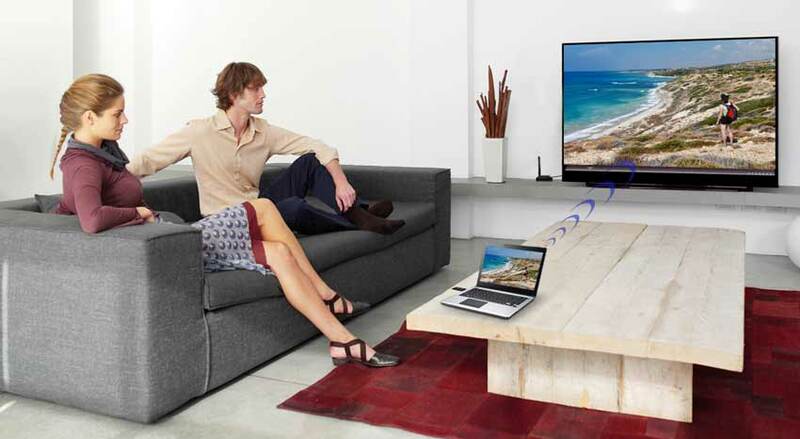 Also, it’s a great way to enjoy and share home entertainment from any HD source wirelessly. Latency max is 200ms. What is so special about the Diamond VS300M is that you can transmit video and audio from one transmitter to two displays. It also features HDMI loop through so you can simultaneously view the same video in two rooms. 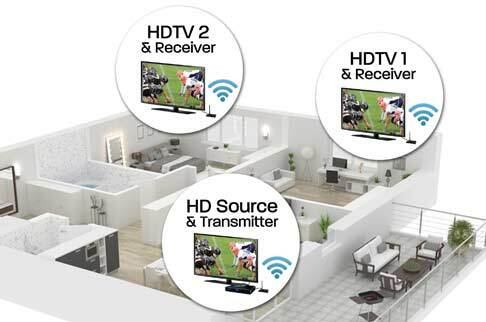 In addition you can add a second receiver and view simultaneously in three rooms (Second receiver sold separately). The Diamond VS300M designed for many applications. Turn your spare bedroom or home office into a place of entertainment without having the need to rent extra cable or satellite boxes. Therefore reducing the cost of hundreds of dollar. 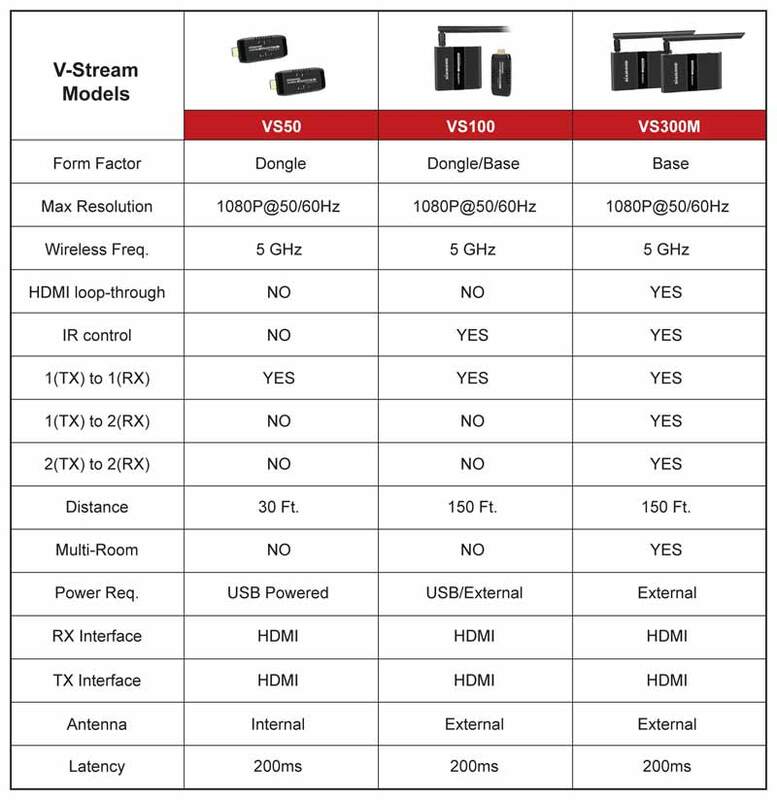 You can also have multiple sets of the V-Stream VS300M. Easily select between two sources and two displays within the same proximity. And this prevents your video from being displayed on the wrong receiver.